Steven E. "Steve" Koonin (born December 12, 1951) is a theoretical physicist and Director of the Center for Urban Science and Progress at New York University. He is also a professor in the Department of Civil and Urban Engineering at NYU's Tandon School of Engineering. Koonin received his Bachelor of Science from Caltech and his Ph.D. from the Massachusetts Institute of Technology. In 1975, Koonin joined the faculty of the California Institute of Technology as an Assistant Professor of Theoretical Physics, and served as the Institute's provost from 1995 to 2004. In 2004, Koonin joined BP as their Chief Scientist where he was responsible for guiding the company’s long-range technology strategy, particularly in alternative and renewable energy sources. 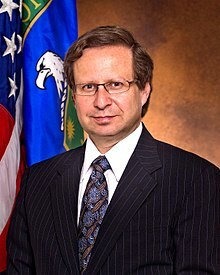 In 2009, he was appointed the U.S. Department of Energy’s second Senate-confirmed Under Secretary for Science serving from May 19, 2009 through November 18, 2011. He left that post in November 2011 for a position at the Institute for Defense Analyses. On April 23, 2012, Koonin was named director of NYU's Center for Urban Science and Progress (CUSP). He has served on numerous advisory bodies for the National Science Foundation, the Department of Defense, and the Department of Energy and its various national laboratories, such as the JASON defense advisory group, which he has chaired. Koonin's research interests have included theoretical nuclear, many-body, and computational physics, nuclear astrophysics, and global environmental science. In "Climate Science Is Not Settled," a 2014 essay published in the Wall Street Journal, Koonin wrote that "We are very far from the knowledge needed to make good climate policy," and that "The impact today of human activity [on climate] appears to be comparable to the intrinsic, natural variability of the climate system itself." Koonin criticized the use of results from climate modelling to support the "scientific consensus" (quotes in original) about climate change, noting that, among other problems, "The models differ in their descriptions of the past century's global average surface temperature by more than three times the entire warming recorded during that time." Regarding climate sensitivity, Koonin wrote that "Today's best estimate of the sensitivity (between 2.7 degrees Fahrenheit and 8.1 degrees Fahrenheit) is no different, and no more certain, than it was 30 years ago. And this is despite an heroic research effort costing billions of dollars." In 2017 Koonin urged interested parties to a drill-down debate with an article, "A ‘Red Team’ Exercise Would Strengthen Climate Science." In support of such an approach, he wrote: "The public is largely unaware of the intense debates within climate science. At a recent national laboratory meeting, I observed more than 100 active government and university researchers challenge one another as they strove to separate human impacts from the climate’s natural variability. At issue were not nuances but fundamental aspects of our understanding, such as the apparent—and unexpected—slowing of global sea-level rise over the past two decades." In early 2018 Koonin was selected by physicist William Happer to create a committee to scrutinize the science underlying the National Climate Assessment (released in November 2017) and form a skeptical but credible second opinion to send to the private National Academy of Sciences for review. ^ "Steven Koonin". Array of Contemporary American Physicists. American Institute of Physics. Archived from the original on 31 March 2015. Retrieved 20 September 2014. ^ "Caltech Appoints Physicist Steve Koonin New Provost | Caltech". The California Institute of Technology. Retrieved 2018-12-20. ^ "Steven Koonin". Department of Energy. ^ Koonin (20 April 2017). "A 'Red Team' Exercise Would Strengthen Climate Science". WSJ. Retrieved 23 April 2017. This page was last edited on 28 February 2019, at 02:23 (UTC).